This is 64-bit replacement basic functions of SGViewer plugin (http://totalcmd.net/plugring/sgviewer.html). 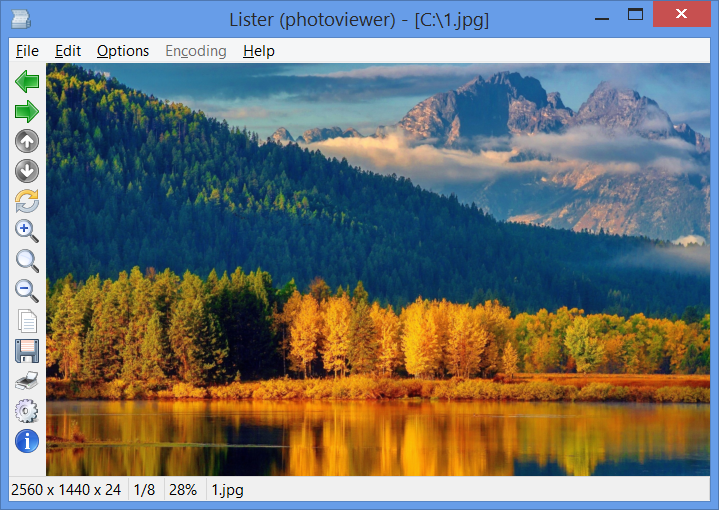 Supported formats: BMP, JPEG, GIF, TIFF, PNG, PSD, JPEG2000, EMF, WMF, DICOM, Camera RAW. Animation not supported. Ver 0.10.3 Beta: * LibRaw library using for RAW enabled by default; * changes and bug fixes. Ver 0.10.1 Beta: * changes and bug fixes. Ver 0.10 Beta: * graphic libraries updated; * improved RAW support with LibRaw library, must be enabled in Setup first; * changes and bug fixes. Ver 0.9.4.13 Beta: * changes and bug fixes. Ver 0.9.4.12 Beta: * changes in Setup dialog. Ver 0.9.4.11 Beta: * updated wallpaper modes for Windows 7 - 10. Ver 0.9.4.10 Beta: + set system wallpaper; * changes and bug fixes. Ver 0.9.4.9 Beta: + additional options for view and slide show. Ver 0.9.4.8 Beta: * changes and bug fixes. Ver 0.9.4.7 Beta: * menu rearranged; * changes and bug fixes. Ver 0.9.4.6 Beta: * changes and bug fixes. Ver 0.9.4.5 Beta: * fix EXIF save to PSD (32 bit); * changes and bug fixes. Ver 0.9.4.4 Beta: * fix EXIF thumbnail reading on startup; * changes and bug fixes. Ver 0.9.4.2 Beta: - removed debug message; + lossless JPEG rotation (Shift-Ctrl-L and Shift-Ctrl-R). Ver 0.9.4.1 Beta: + PSD: read/write basic EXIF values; * changes and bug fixes. Ver 0.9.4 Beta: * graphic libraries updated; * improved RAW support; * changes and bug fixes. Ver 0.9.2.1 Beta: * bug fixes. Ver 0.9.2 Beta: * graphic libraries updated; * changes and bug fixes. Ver 0.9.1 Beta: + new setup options (menu Setup - Setup Dialog...); * changes and bug fixes. Ver 0.9 Beta: * public release.